Dennis has changed his iconic striped jumper in support of the Save the Children Christmas Jumper Day on Friday 14 December. This week’s issue of the Beano comic encourages fans to don a festive knit for a great cause, as character Dennis swaps his infamous jumper which he has rarely been seen without since his 1951 debut. 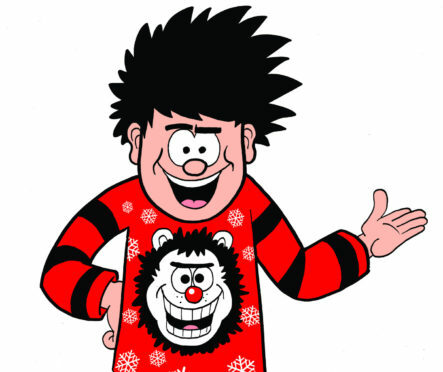 Dennis’ Christmas jumper, is available to pre-order from the online Beano shop and features Gnasher’s face with a Rudolph red nose and Dennis’ trademark red and black stripes. The ‘Christmas Jumper Day’ themed Minnie the Minx strip also features Dennis and The Bash Street Kids, as they compete against each other to be recognised for wearing the silliest Christmas jumper in Bash Street School’s fashion show. On the morning of the big day, disaster strikes as Minnie the Minx turns up to class to find that she’s the only pupil to have forgotten Christmas Jumper Day. In a bid to steal the limelight at the special school fashion show, Minnie creates her own outlandish DIY version. This week’s issue also includes an amazing competition where one lucky fan will be in with a chance of winning Dennis’ Christmas Jumper. Beano’s Christmas Jumper Activity Book which features 32 pages of festive activities, games and puzzles, will also be awarded to 25 runners-up. To enter, fans are challenged to design their own Christmas Jumper for Dennis and submitting their drawings by email or post by December 12 2018.